The Miami Marlins finished off yet another disappointing season last week. Under the ownership of one of the least patient leaders in the game, changes are inevitable, just a year after a major renovation. But looking at the Marlins’ roster as a whole, major rebuilding might not be all that necessary. After having observed the last eight seasons of the Washington Nationals, I believe the key to rebuilding is a centerpiece–a versatile, reliable player who is willing to sustain the ups and downs of a franchise in order to reach the end goal, no matter how long it may take the team to arrive there. Five years ago, the Florida Marlins had that guy, and his name was Miguel Cabrera. However, money became an issue and he was dealt. Since then, a few potential leaders have emerged, but inconsistency and injuries have marred the Marlins’ quest for a franchise player. The Marlins’ core “2006” group highlighted by Hanley Ramirez, Dan Uggla, Josh Willingham, Josh Johnson, Ricky Nolasco, and Scott Olsen appeared for a few seasons to be an answer. However, Ramirez was the “stand-out” of the group, and did not show the maturity and leadership capability necessary to be that centerpiece. More players came and went, and the Marlins were still without answers. Right now, Miami has a player who is looking more and more like “the guy.” Giancarlo Stanton has all the qualities of a franchise player on and off the field. The only problem I see that would prevent him from turning into someone like Ryan Zimmerman, Ryan Braun, Josh Hamilton, or Buster Posey is that he is too much of a power hitter. The traditional, versatile centerpieces of the game all hit for average before they hit for power. Granted, the power most certainly exists, but it is not the focal point of their respective approaches. But, for the time being, Stanton is the best player they have, and the only star who could realistically turn into the face of the franchise. Once that franchise player is in place for a team, the rebuilding becomes easier. The Marlins are at an advantage because Stanton is so young, they have some time to work on the construction before he reaches his prime. Last season, the Marlins had a good supporting cast, and tried to place Jose Reyes in as the centerpiece. As it turns out, they got the formula backwards. The centerpiece comes first. As far as the supporting cast for the future goes, the Fish have some answers already. In the infield, Reyes is a slick-defending shortstop, and should be a stud for a few more years. At second base, Donovan Solano emerged in 2012 as an enthusiastic, high-potential player. He is a lot of fun to watch and has a great attitude. After Gaby Sanchez was traded this summer, Carlos Lee was the default first baseman for the remainder of the year. However, his size and age should not appeal to the Marlins. And they have a great first baseman already in Logan Morrison. Morrison had his defensive struggles in the outfield, and he would be much more valuable at first. In the outfield, Stanton is a lock in right, and Emilio Bonifacio should come back to roam center. 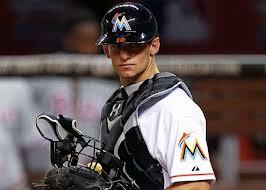 Justin Ruggiano broke out this year for the Fish, and he will most certainly return. He could platoon with Bonifacio in center, and/or take up left field. Bryan Petersen, Scott Cousins, and Chris Coghlan could all make decent fourth outfielders, however none of the aforementioned back-ups have reached their prospected potential and have been large disappointments. Rob Brantley exceeded expectations when he was called up this year to catch. John Buck had been a disappointment in his first two seasons with Miami, and Brett Hayes did not seem to be the answer to start behind the plate either. Buck has very little value to the Marlins right now, as Hayes would be a better back-up option. That leaves the only real, positional uncertainty at third base. Chris Coghlan played infield–second and third–in the minor leagues, but his bat does not appear to be big league-capable. Therefore, a major acquisition is needed at third base. This could be achieved either via trade or free agency; however, the Marlins should avoid signing a big-name veteran who could interfere with the leadership of Jose Reyes or attempt to overshadow the stardom of Giancarlo Stanton. As has been the case since Josh Beckett and A.J. Burnett left South Florida, pitching is a problem…I’ll leave it to Jeffrey Loria to try to solve that again. But the Marlins have internal options at almost every other position. It is difficult to speculate, but something just might click next year if the front office plays the cards right. After all, it’s hard to get much worse. I’ve always wondered this about the Marlins: How frustrating is it to see so many players get dealt. Not only that, but is seems to me as an outsider that the players the Marlins deal have an unusual amount of success on other teams. No doubt it’s frustrating! The first major trade after I began following the Marlins intently was when Cabrara and Willis were dealt to Detroit. At the time, the Marlins got quite a package of prospects, unfortunately none of them blossomed into their speculated potential. Cameron Maybin was probably the best of the bunch, and he is now a star in San Diego. I’m happy for him, but I do think the Marlins should have been more patient with him. Guys like Maybin, Cabrera, Beckett, Uggla, and even manager Fredi Gonzalez certainly have had more success on their post-Miami team(s). But the Marlins have dealt players at the right times like Dontrelle Willis, Chris Volstad, and even Mike Lowell, who was slightly past his prime when he was traded. All-in-all, it is frustrating to see so many players come and go. I strongly believe that if the Marlins and Nationals had switched owners in 2006, the Marlins would now be where the Nationals are, or even better. They have had plenty of talent, but were led nowhere. Honestly, though, I’ve become so accustomed to it that trades are expected–to the point where Hanley’s departure this summer had relatively little effect on me.